The Alexander Technique is an excellent tool to help recover from (or prevent!) Repetitive Strain Injuries and Carpal Tunnel Syndrome. The student learns focused awareness of the excess contraction or strain that people unknowingly add to repetitive movements. Bringing the principles to small, precise movements changes the habits that contribute to pain and then these activities can be performed with comfort. Taking Alexander lessons is a practical, constructive approach that can be applied in your daily life rather than a set of exercises to be done over and above your normal commitments. You learn that in any moment you truly have a choice to react with your old level of tension or in a new way. 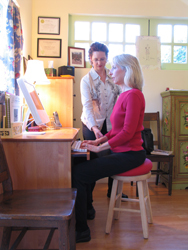 An Alexander Technique teacher is a highly trained movement and posture professional. When you go for an Alexander lesson, Constance observes how you move, sit and function. She then pinpoints compressive movement habits and helps you release them, enabling you to sit and move more efficiently and comfortably. Such changes can relieve pain and often solve the problem entirely. Taught in private individually tailored sessions, the Technique is cost-efficient and non-invasive, with no adverse side effects. With the unique, soothing Alexander touch, Constance can help you access an untapped reservoir of physical freedom, ease and embodied wholeness.